One of the reasons I made this dish is that Pam Anderson’s daughter, Maggy, said it was one of her favorites from the book. And I can see why. But can I just ask: when did pearl onions become an endangered species? I went to three stores and could not find them either frozen (as specified in the recipe) or fresh, what is up with that? My primary grocery store is Jewel, owned by Supervalu, which also owns Shaws/Star Market, Albertsons, etc. And I read recently in Store Brand Decision magazine (the one with Lindsay Lohan on the cover) that the company is trying a new strategy whereby they reduce the number of SKUs by up to 25% to make room for their profitable store brands and “reduce clutter.” This is part of the company’s growth strategy, called “Project SHE” which stands for “Simplify Her Experience.” Who thought that up, Don Draper? Don’t you love when a company gives you something less or something inferior but puts a positive-sounding name on it to suggest that they’re doing just the opposite? So perhaps this is why I can’t find pearl onions (I used scallions). This was really delicious. The recipe calls for 2 lbs of boneless skinless chicken thighs and I stupidly bought 2 lbs. with skin and bones, so by the time I skinned and de-boned them there really wasn’t much chicken. Even so, 2 lbs of chicken is pretty stingy to serve 6, so I’ve increased in my adaptation. You could probably use breasts too since you’re cooking it in liquid so they wouldn’t dry out too badly. My potatoes took much longer to become soft but they may have been too big; I also changed the recipe to leave the pan lid on completely for this step as it helped the potatoes cook faster when I did it. Serve this with rice or noodles to soak up the fantastic sauce. Grouped with this was in the book were Smoked Trout Pate, Baby Spinach with Beets, Goat Cheese, and Toasted Walnuts, Creamless Chocolate Mousse with Vanilla Ice Cream. Heat a 12″-wide, deep skillet over medium-high heat. In a medium bowl, coat chicken with 1 tablespoon oil; sprinkle both sides generously with salt and pepper. Working in 2 batches, add chicken to hot skillet. Cook, turning only once, until well-browned, about 6 minutes per batch. Transfer to a bowl and set aside. Add 2 teaspoons oil and onions to skillet and cook, stirring frequently and seasoning with salt and pepper, until golden brown, about 3 minutes. Add to chicken. Add remaining 1 tablespoon oil and mushrooms to hot skillet and cook, stirring up browned bits and seasoning lightly with salt and pepper, until golden brown, about 3 minutes. Stir in prosciutto, garlic, and tarragon and cook until fragrant, about 1 minute. 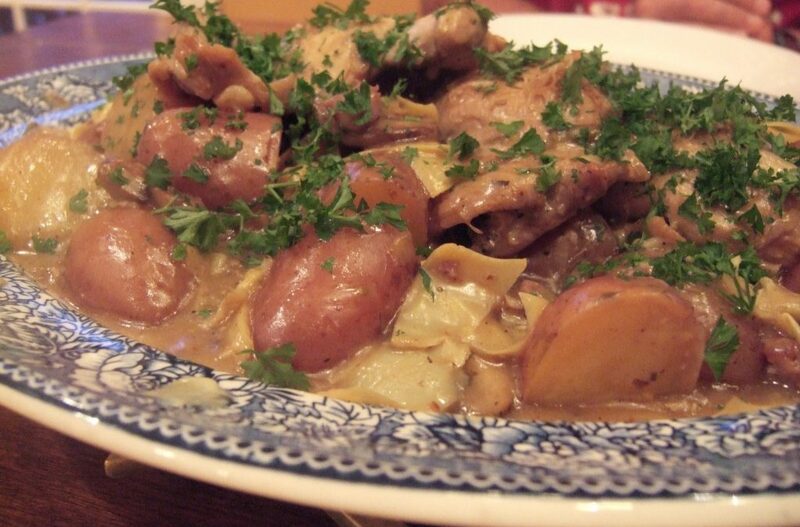 Stir in flour, then wine and broth, along with chicken and onions, artichokes, and potatoes. Bring to a boil, reduce heat to medium-low, and simmer, covered, until potatoes are tender, about 20 minutes. Stir in parsley. Cover and let stand for 5 minutes to blend the flavors before serving. I couldn’t agree with you more on the Pearl Onions!! Oh…..Katie! What a day to read this! It’s cold and rainy here, and I have everything you listed (including frozen pearl onions – loved the reference to Don Draper; it does sound like him, doesn’t it?) I’ve been running errands all day, Maybe tomorrow. Sounds great. I would email the store and enlighten them to your substantial ire…. Sadly, they don’t care about me. They care about the women who want a cheaper version of Kraft Macaroni and Cheese and the best price on ground beef. I’m not dissing those women — God knows not everyone needs to love cooking or can afford to do it as a hobby — but I see an opportunity for a retailer willing to cater to those of us who want selection and quality above all. What’s the deal with pearl onions? Finally found them at Dominick’s fresh (in one of those netted bags – the produce guy says he’s never heard of frozen pearl onions before – then again, he looked like he was 21 years old). 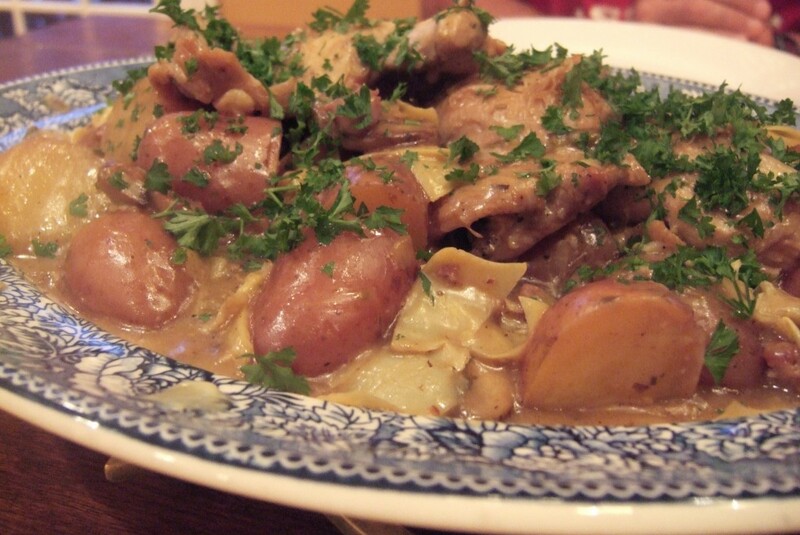 Made this dish with fresh onions and fresh tarragon – turned out fantastic. As is my quest for most recipes, I also made a vegetarian version side-by-side, using fried tofu instead of chicken. My husband wants me to make another batch and freeze it so he can share the dish with his parents. And easy? You bet. This will be on our regular rotation.